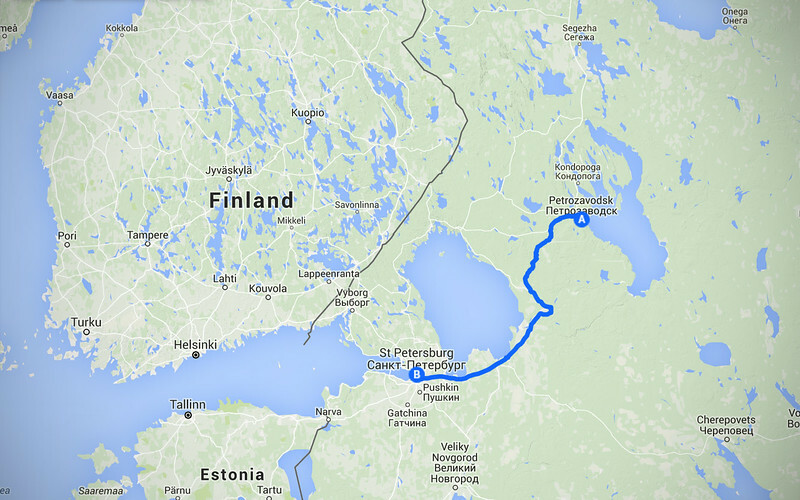 We're heading south today, away from the hinterlands of Karelia towards more populated parts of Russia. Not sure what exactly he's selling, they look like trinkets and fruits and vegetables. But from what I know about people selling stuff from the back of a truck on the side of the road - most likely it's not entirely legal. We eat our food on the other side of the road while the driver eyes us warily. I sense he is ready to make a break for it if he suspects we are KGB. Oil is leaking out of my shaft drive. I hadn't noticed this through Norway because it was raining so much, but this stretch of dry weather we're having has allowed the oil to collect at the bottom of the hub so it's finally noticeable. Dammit! I just had the seals replaced 20K ago! It doesn't look serious enough that it requires immediate attention, so we'll forge ahead and try to get it looked at when we pass a BMW shop. 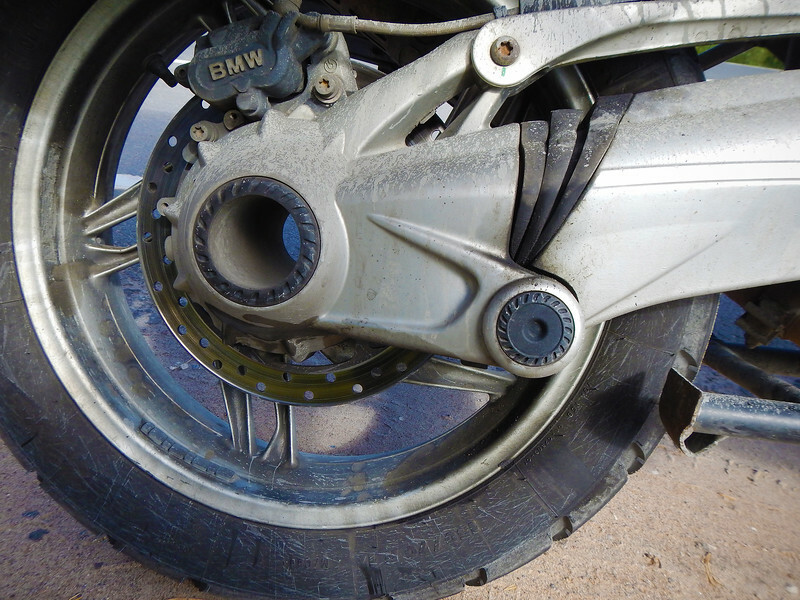 On the whole, my bike hasn't had that many problems given the age and the mileage it's done, but by far the weakest part of the motorcycle is the shaft drive. I've had so many problems, it's been quite costly and time-consuming. Russia is currently going through a food crisis. Most of the countries in the western world have imposed economic sanctions on Russia because of the invasion in Crimea, mostly against the finance, defense and energy sectors of the Russian economy. In retaliation, Russia responded with their own sanctions against these countries, refusing to buy food from them. Although this sounds a lot like shooting themselves in their own foot, I found out that Russia imports a lot of food from western countries and currently there are mountains of produce in Europe piling up and these sanctions are significantly impacting the economies of countries who trade with Russia. Norway exports a lot of fish and seafood to Russia, and Canada's pork industry is heavily reliant on them as well. Russia is still able to provide basic sustenance for their citizens. The sanctions apply to meat, fish, fruit, vegetables, dairy and poultry, all stuff that Russia is able to provide once it ramps up its own produce industry once again, but in the meantime, the supplies are scarce in the grocery stores and the prices are climbing in response to the shortages. To make matters worse, the government has decreed that any Western food imports already in the country will be destroyed. We just read in the newspaper yesterday that massive quantities of cheese have been bulldozed into the earth. So far, 550 *tonnes* of "illegal" food have been steamrolled, burned or buried. That is crazy!!! 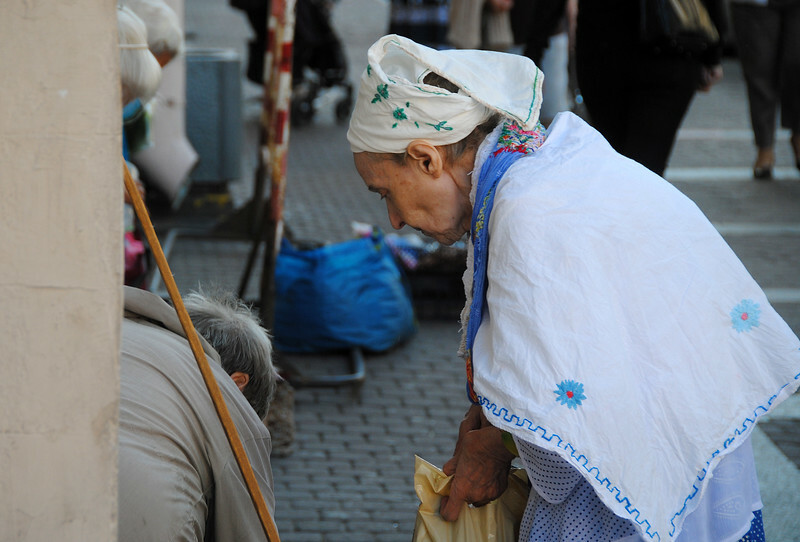 Although Putin receives a lot of support and approval in his country, these latest acts of nose-thumbing towards the west have gone too far in the minds of many Russians, especially when there is still so much poverty in the country. And yet in other news, girls wearing t-shirts reading, "Eat Russian" are marauding through grocery stores and reporting illegal western foods still on the shelves to the police. It is quite amazing to be in the middle of all of this while it's happening. All this is fine, as long as the price of our beloved cырок stay low! When we first entered Russia, Neda picked up this candy in the grocery store called cырок (syrok). We didn't know what it was, but when we bit into it, it was delicious! It's basically sweetened cheese curds covered in chocolate. The curds have the taste and consistency of cheesecake. You can get them in different flavours, also with jam as well, we love it! Every time we go grocery shopping now we pick up more syrok. Hopefully the ban on dairy will not affect the pricing on our beloved cырок! 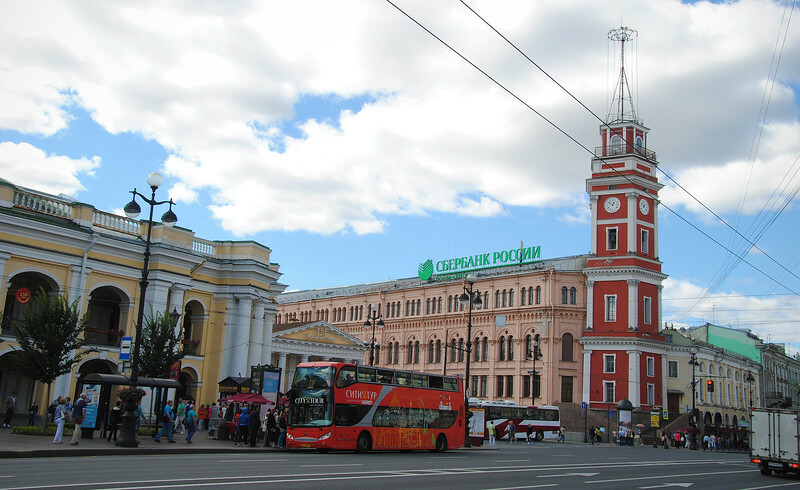 As we get closer to St Petersburg, the second-most populated city in Russia, the traffic starts to get more dense. 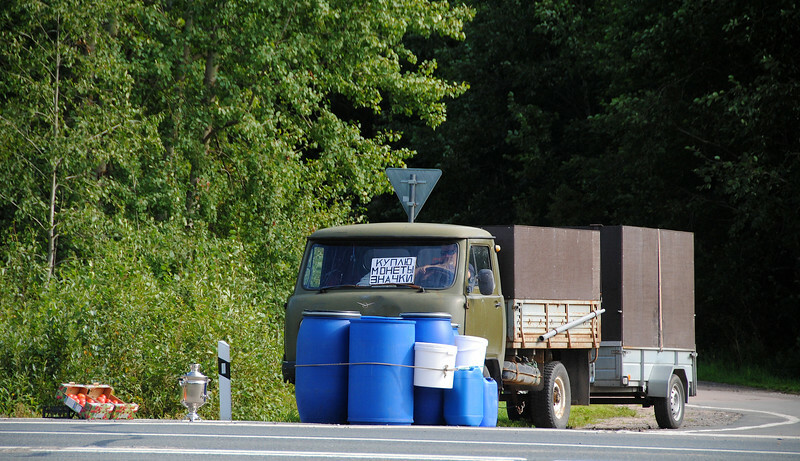 As the cars and trucks continue to clog the roadways, the drivers become much more reckless. Impatient drivers from oncoming traffic pull out into our lane, only to pass one or two cars at a time. They wait until the very last millisecond to duck back into their lane. There is a lot of swearing going on in our helmets as a couple of drivers don't even bother to tuck back into their own lane, forcing us onto the shoulder! WTF!!!! 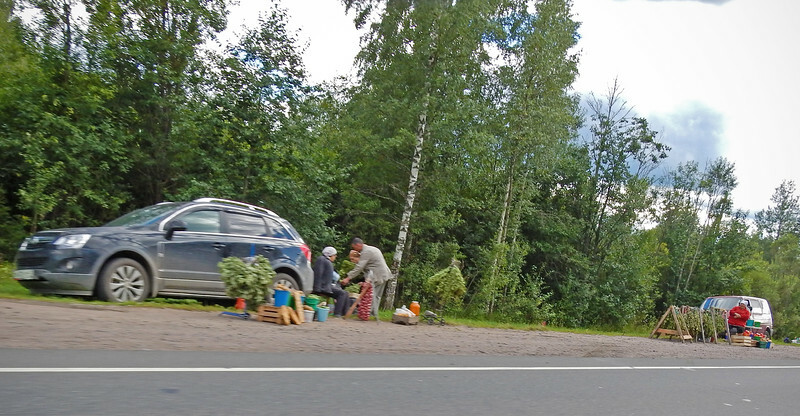 These are the crazy Russian drivers we had heard about. It was terrible. Last year, there were over 220,000 traffic accidents in the country, contributing to 28,000 deaths. Just go on YouTube and search for Crazy Russian Drivers. A large part of the problem is poor traffic enforcement. Lawlessness on the road is rampant when you know nobody is going to stop you from doing idiotic things. We're still riding without insurance, so this worries me quite a lot. To make matters worse, an hour outside of the city, I noticed that my engine is losing power at high revs. Everything under 4,000 rpms is fine, but the minute I rev the engine above that, it loses power. ARGH!!! This is very concerning, it's the first serious issue I've had with the engine. What makes matters worse is that we're on a tight timeline through Russia. We can't afford to hunker down in a city and try to get it fixed here because of the looming expiration date on our visas. This is stressing me out a bit and just hammers home the point that we are not psychologically prepared to continue overland across Central Asia with all of its strict entry and exit dates. As long as I keep the revs down on the engine, everything seems fine. 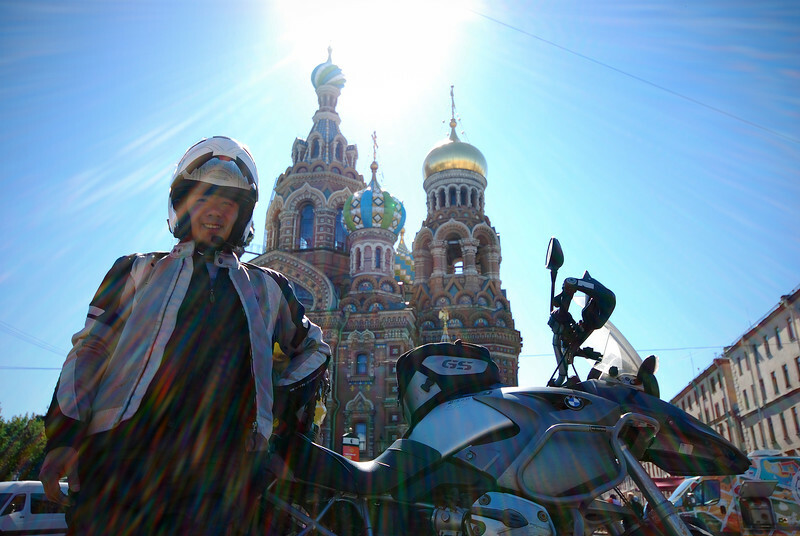 We limp my bike through the gauntlet of crazy Russian drivers without insurance into the heart of Saint Petersburg and try to find our hotel. We find our hotel and thankfully they are able to find us a parking spot in this crowded neighbourhood. I park my bike and christen the spot that it's resting on the Church on Spilled Drive Shaft Oil. I have to do some Googling to figure out how serious the engine problem is. 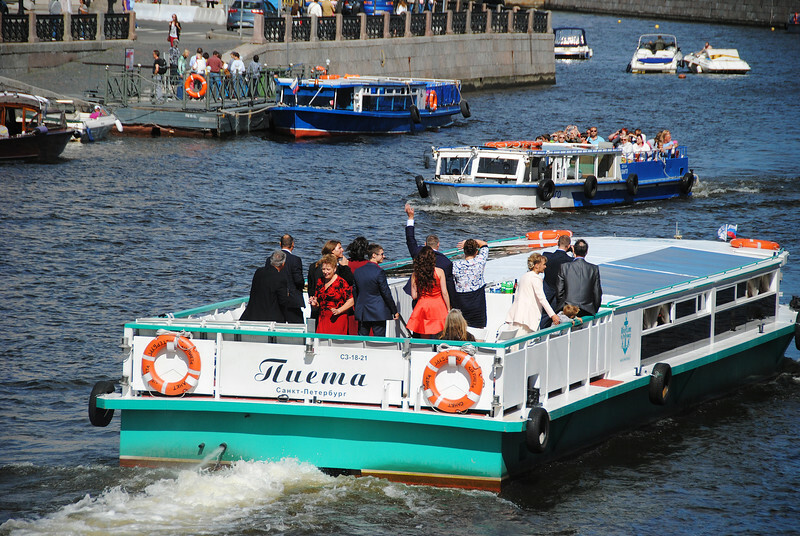 Saint Petersburg is basically a city built on over 40 islands. Connecting these islands are 342 bridges, which earns it its nickname: "The Venice of the North". 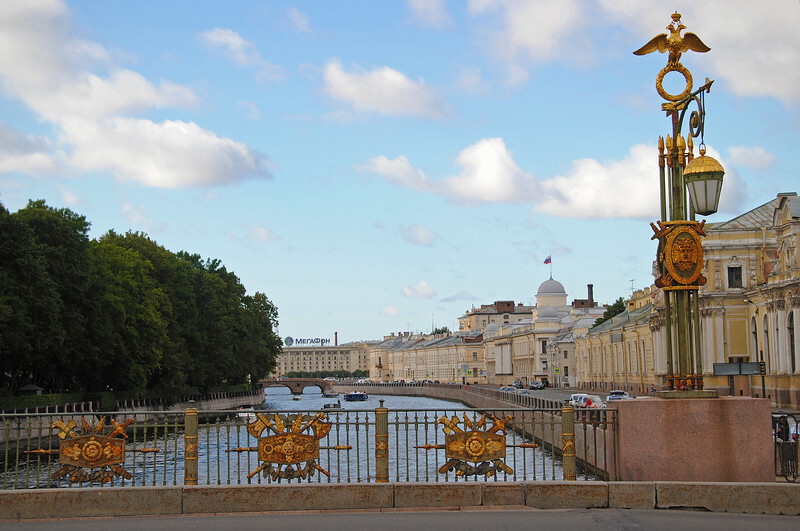 Most of these islands are very close together, the bridges spanning over canals no wider than a four-lane road. 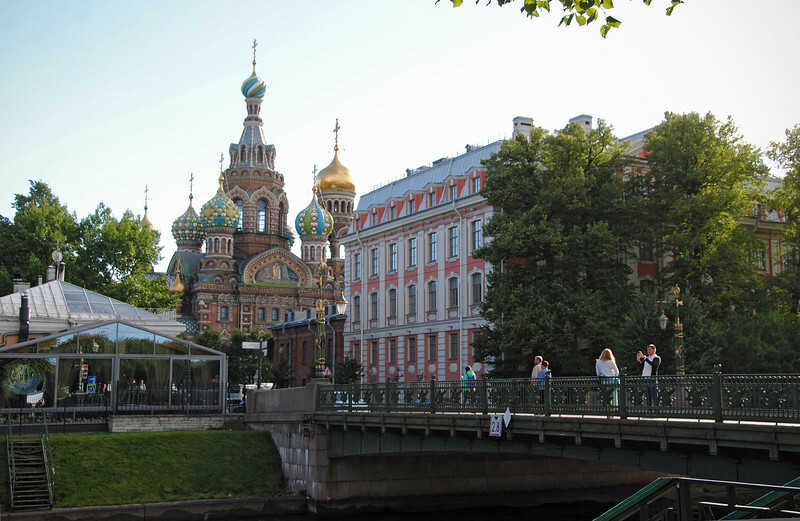 Saint Petersburg is such a beautiful place. 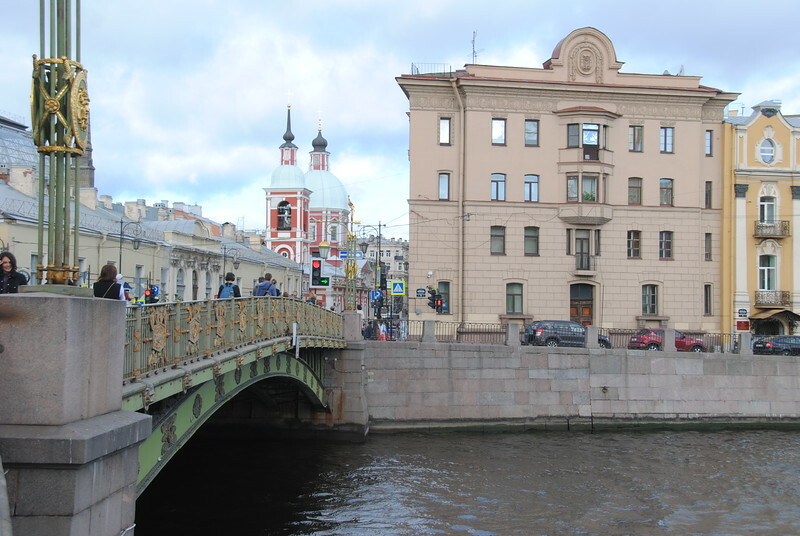 It's the most westernized city in Russia and the architecture is so reminiscent of all the old European cities that we've visited in the last year and a half. However, this wasn't the Russia that I was hoping to see. 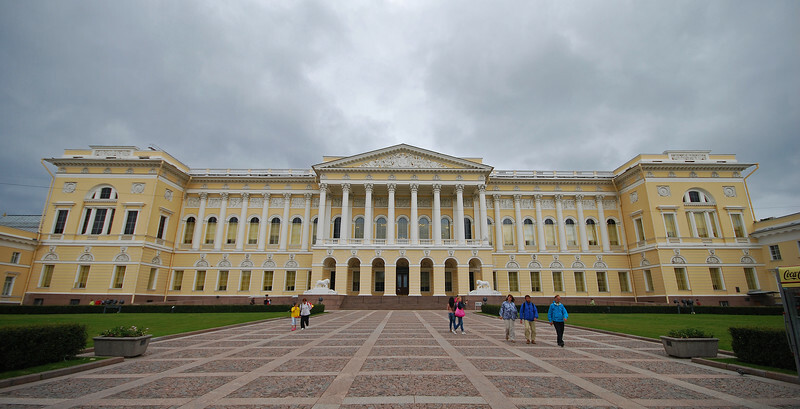 After the western media's Cold War indoctrination on the evils of the USSR, I wanted to see some of that Soviet culture in the buildings, the people and their stories. I so wanted to talk to an older Russian person, to ask them what it was like experiencing the Cold War from the other side of the Iron Curtain. What did they think of the western world? Did they fear and villainize us like we did them? 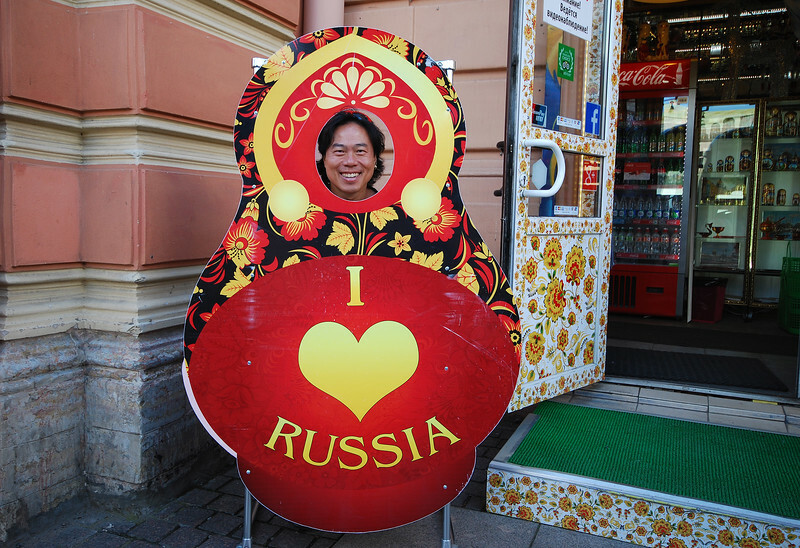 These are the things I was most curious and fascinated about coming to Russia. 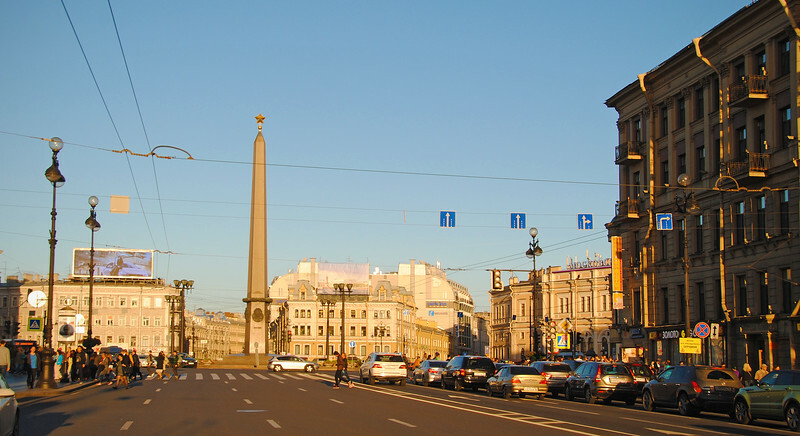 But Saint Petersburg is not going to satisfy my curiousity. It's basically Europe. 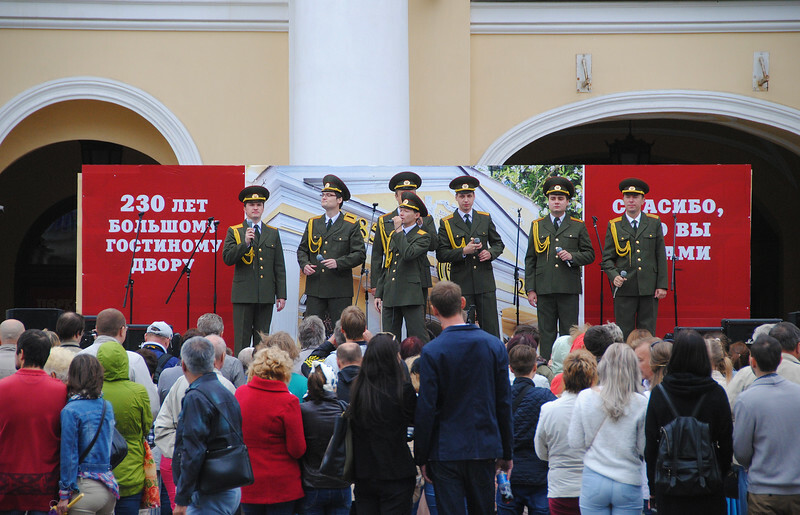 Members of the Russian army choir outside our hotel giving a concert. They were singing Adele's Skyfall... See what I mean? 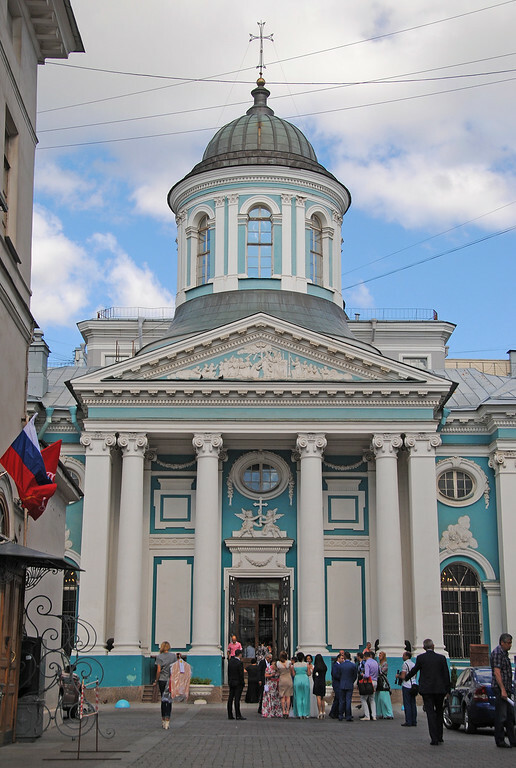 The Russian Museum houses a vast collection of fine art throughout this country's history. 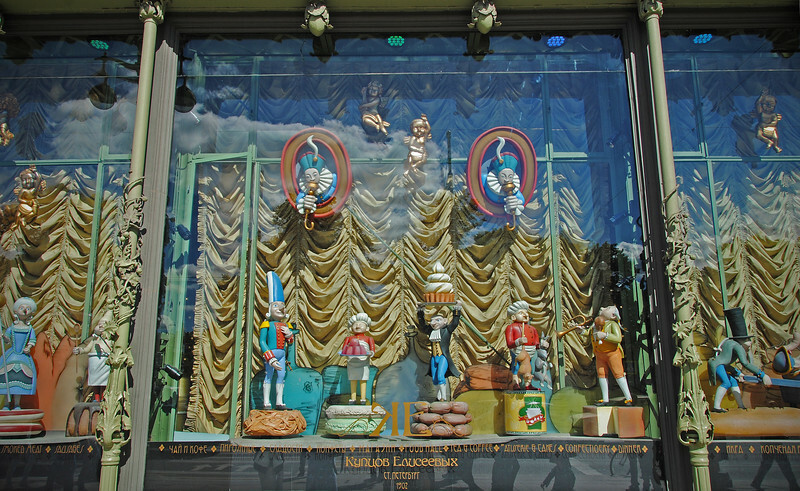 I think there's a lot of over-representation of art from the 18th-19th century, lots of cossacks on horses. It seems to be the most celebrated and romantic period. 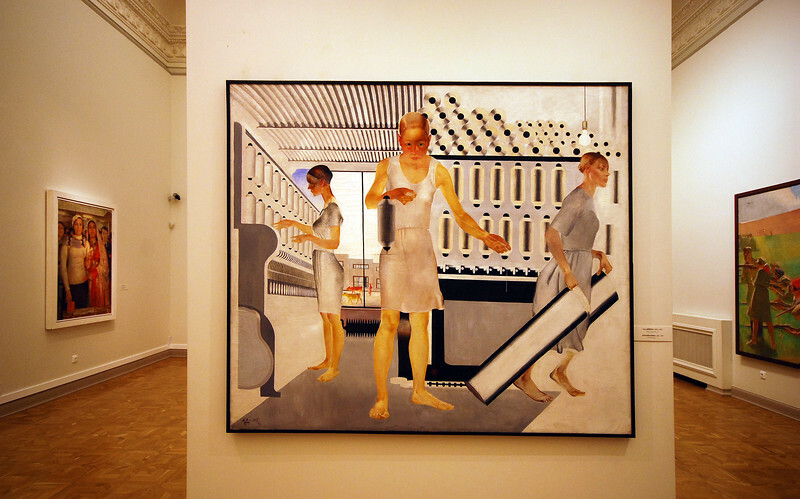 However there was very little on the art of the Soviet era, from the 1920s through to the late 80s. It's not surprising, this was a difficult period for most Russians, marked by poverty, hunger and lower life expectancy. A lot of art historians think the Socialist Realism movement is boring. They call the art, "Girl Meets Tractor". I don't care what they say. Personally, I think this period of Soviet art is fascinating. I see so much struggle in the brush strokes portraying the common people caught in a larger political upswelling, the waves of an ideology that mattered none to the toils of putting food on the table. The picture on the left, "Queue" by Alexei Sundukov in 1986 really hit home for Neda. From the style of the clothing that the women in line were wearing to the theme of the painting, it really reminded her of former Yugoslavia. It struck me that I didn't really need to find someone to talk to about the Soviet era. I was already traveling with one. Actually not present-day Russia... I've discovered I'm a bit of a SovietPhile! The adventures of Comrade Neda and Evgeny continue.